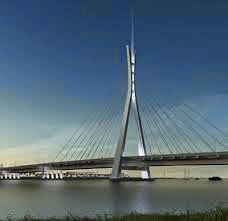 Attempts by the Lagos State Attorney General, and Commissioner of Justice, Mr Ade Ipaye to persuade the Federal High Court Lagos to hear an application seeking a stay of execution of the judgment which declared tolling on the Lekki-Ikoyi link bridge as unconstitutional has suffered a setback. Presiding Justice Saliu Saidu refused to hear the application insisting that it was not yet ripe for hearing. The judge noted that from the file before him, there was no evidence that the Attorney General of the Federation (AGF) and the National Inland Waterways Agency (NIWA) were served with the application. The Lagos State Attorney General had, however, urged the court to proceed with the application on the ground that the main party affected by the application, Mr Ebun-Olu Adegboruwa was in court. In his response, Mr Adegboruwa said the Lagos State Government ought to have taken steps to ensure service of the application on the other parties. Justice Saidu has, however, fixed April 14, 2014 for hearing of the application. On the 27th of March, Justice Saidu, had held that from the totality of the evidence before him, it was clear that there was no law backing tolling on the bridge, and that the government was wrong to have turned the bridge into a business venture. The judge had given this judgment in a suit filed by Mr Adegboruwa, who challenged the power of the Lagos State government to collect tolls on the bridge. Dissatisfied with the judgment, the Lagos State government, through its attorney general filed a motion urging the court to stay execution of the judgment which declared tolling on the bridge illegal, pending the determination of an appeal filed at the court of appeal in Lagos. But Mr Adegboruwa, in his counter-affidavit, is insisting that the state government lacked the right to apply for a stay of execution of the judgment having failed to comply with it for just one second. In the counter-affidavit, Mr Adegboruwa recalled that the state government was represented in court on the day of the verdict by the Attorney General. Mr Adegboruwa, who is also a Lagos based lawyer, had noted that after the verdict, he proceeded to use the bridge, but was not allowed to pass through the barrier placed on the bridge by officers of the state government without paying the toll. He added that the officers of State government together with armed policemen were on hand to compel motorists to pay the toll fee before they could be allowed access through the toll plaza. He has therefore, urged the court to refuse the motion for a stay of execution of the judgment.